sandwich fillings. I also think that great burgers need to start with a delicious bun. There’s a burger place near my house, and while I don’t really like the burgers themselves (too greasy), the bun is delicious. It has a shiny exterior, is slightly chewy, and is buttery. I’ve been wishing I could make that bun at home for a while. 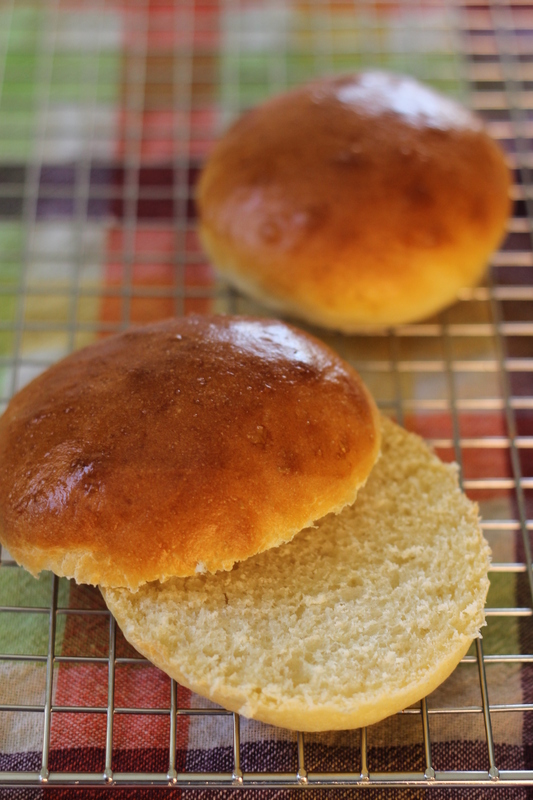 Now, these burger buns aren’t really that much like those buns, but they are delicious nonetheless. They are perfectly fluffy, but sturdy enough for a hearty burger. They also have a slightly sweet, buttery flavor that is irresistible. Also, they taste just as delicious spread with butter as they do with a burger on them. We’ve made them several times now, and they are a million times better than any bun that you could find at the grocery store. You should make them sometime soon, and we promise that they will make any burger taste better! 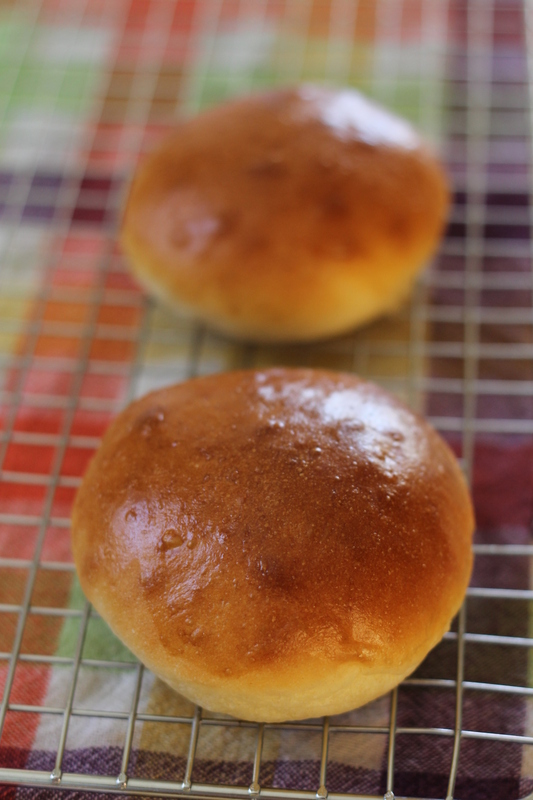 Check back on Wednesday for a great vegetarian burger to put on these buns. Place the milk, water, yeast, sugar, salt and egg in the bowl of a stand mixer . Mix briefly with the paddle attachment. Add the flours to the bowl, and mix until combined. Add the butter. Switch to the dough hook and knead on low speed for about 6-8 minutes. The dough will be pretty sticky, but that’s the secret to light and fluffy buns. Transfer the dough to a large, well-oiled bowl and turn several times to coat. Cover the bowl with plastic wrap. Let the dough rise for 1-2 hours or until doubled. Line two medium baking sheets (or one large one) with parchment paper. Divide the risen dough into 8 pieces, either with a sharp knife or a dough scraper. Roll each piece into a ball and place on the baking sheets. Cover the buns with greased plastic wrap and let rise again until nearly doubled, another 1-2 hours. Meanwhile, place a 9×13-inch pan of water on your oven’s lowest rack. Preheat the oven to 400 degrees F. Brush the risen buns with the egg wash, and sprinkle with sesame seeds or poppy seeds as desired. Bake the buns for 15 minutes, until golden brown. Rotate the pans halfway through. Let cool briefly on the baking sheets, then transfer to a wire rack. Enjoy!